There's a new summer 'con for toy and comic fans --the 1st Singapore toy and Comic Convention, to be held on June 27th through the 29th @ the Suntec Singapore International Convention and Exhibition Centre. The event will be open to the public with free admission for all -- sweet. Organized by PI Events, a division of the makers of Trexi and numerous vinyl toys, STCC will feature high-profile exhibitors including Hasbro, Lego, Medicom and Nintendo as well as a walk-of-fame with personal appearances by Pete Fowler (UK), Simone Legno of tokidoki (IT), Devilrobots (JPN), Joseph Wong Chak of Old Master Q (HK), and Gary Erskine (UK). In addition, STCC will offer numerous free exclusive toys to attendees. 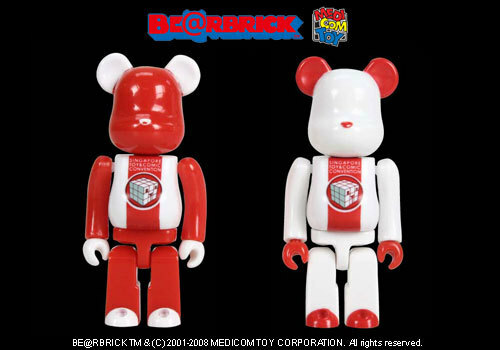 In addition to two STCC [email protected] from MEDICOM TOY , several additional giveways will be offered through the use of the 'con's passport system. Attendees will collect stamps in their STCC passport which will be redeemable for the exclusive giveaways. So if you're lucky enough to live in Singapore or can get there, check out the 1st STCC ever.